With so many brands of probiotics on the market, how can you find the right one? Because every product claims to be the “most effective“, it can be hard to find the probiotic that best suits your particular needs. Luckily, that’s what we’re here for. This list ONLY includes probiotics which are manufactured in accordance with cGMP guidelines. If a probiotic was NOT manufactured in clean, regulated conditions, as per cGMP guidelines then in all likelihood it will not only be ineffective but it could be POTENTIALLY HAZARDOUS! There are 5 factors which impact our grade of each probiotic. They are listed and explained below. Price – this one is pretty self-explanatory. Potency – WAY too many companies leave their probiotics sitting around gathering dust, over 50% of the brands that we tested had ZERO live cultures left! Potency is the % of live cultures we discovered upon testing the brand, you’d be surprised at how many companies store their probiotics for way too long. CFU (Colony-Forming Units) – this is the total count of all of the bacteria in the probiotic, VERY important because probiotics are ONLY EFFECTIVE IN ADEQUATE AMOUNTS. Strains – total number of different types of bacteria in each probiotic, varies greatly and, along with strain diversity, affects the types and levels of benefits that you will notice. Strain Purity – a combination of the effective concentration of the strains within the probiotic and the functional quality of the active cultures (the ability of the bacteria to perform its specific job). BlueBiotics capsules are also free from unnatural additives, contain a resistant-starch which serves as a food and fuel for the probiotic strains, and are enteric-coated to protect the strains which aren’t acid-resistant from being destroyed by your stomach acids. Despite the hefty CFU advertised by Ultimate Flora, a large portion of the probiotic colonies were no longer alive upon analysis. This resulted in the effective CFU being much lower than what was claimed by the product. We were a little disappointed to see that this product was not enteric-coated. Although enteric-coating is not necessary for roughly 70% of the cultures in this probiotic, the remaining 30% (probiotics such as Streptococcus Thermophilus) will be devastated by your stomach acids. That is the only real drawback for an otherwise exemplary probiotic. The 13 strains in this probiotic include complete lactobacillus and bifidobacterium complexes, as well as two variants of the Streptococcus Thermophilus bacterium. Additionally, this supplement features enteric-coated capsules ensuring that your stomach acids won’t eat up the probiotics before they get to your intestines. The only reason InnovixLabs didn’t outrank a couple other probiotics on this list was due to its worrying amounts of additives, including: Microcrystalline Cellulose, Hydroxypropyl Methylcellulose, and Silicon Dioxide. This product does contain the magnesium stearate additive, and the CFU/Strain count is a little under the recommended levels, however those are only a couple negative marks on an otherwise incredible product! Want to learn more about probiotics? Take a look at our guide to understanding probiotics here. Did you try Vital Reds and if so how did it compare? Gundry Vital Reds are not included because they are not strictly a probiotic. They only contain a small amount of probiotics. Julia. Are these prices for one month? Hi Adele, it depends on the product. These range from a one-month supply to a three-month supply. These are recommend by Dr. Will Bulsiewicz, the S.C. gastroenterologist, who seems to understand the microbiome better than most. I’d really like to know if you have evaluated them and what you think. Thanks. Hi Peter, we haven’t had the opportunity to test that product, but it looks promising, so thanks for bringing it to our attention. Can you take probiotics irregularly? I typically only remember to take them on weekday mornings. Many people I’ve spoken with take large doses of probiotics only when they notice an upset stomach. I do take probiotics regularly, but often up my dose depending on how I feel. You can find a list of probiotics we reviewed under probiotics > reviewed brands at the top of this page. Many brands did not make the cut to the top 5, and we’re not included on this page. Since I have been using this product I have lost 35 pounds,so that now I believe it has really helped me in my quest to lose weight this product works.It does what they promised,helps with the stomach and water weight,blood pressure…I love it!!! What product did you use? And has it still proven itself with sustained weight loss? Thank you. which brand do you attribute to having helped with weight loss? This question is for Alice White. Which product are you taking that has helped you lose weight, helped with the stomach, blood pressure, etc.? Hi Alice, which brand product helped you? What are the side effects and how long have these pills been on the market? Which product do you use? I have taken various brands for years. Would love to quit my blood pressure meds. So happy probiotics have changed my life. The BlueBiotics probably look as if it may be the best one to take. We think it’s a very well-formulated product. Which Probiotic works? I’m confused by these comments because I don’t know what product they’re referring to. Each of these supplements has their own merits depending on your health condition but we recommend BlueBiotics, as it contains the most strains, meaning it addresses a wider variety of health issues. I will sure like to try these products out! Seems good. I consider buying some. It really helped me. It is also really cheap. I would like to know which probiotic is best for IBS and fibromyalgia. Is important to use a product with with one or two cultures with the fibromyalgia? Can you find these probiotics you have mentioned over the counter at health stores or drug stores? Many users report that Probiotics help with IBS (Irritable Bowel Syndrome). I would start with the top of the list with a probiotic that contains saccharomyces boulardii – BlueBiotics. There is some research that suggests probiotics could help with fibromyalgia, I would recommend a probiotic with more that just 1-2 strains. Find one with top proven strains (5+) and a high CFU! Hi, I am just wondering what is the best prebiotic to take daily for myself. I’m 18 years old and I struggle with constipation. Hi Kimberley, I recommend getting your prebiotics from a healthy diet of vegetables. Do you have any conflicts of interest in this article? Did any of these companies pay for any or all of this review? Great review, just want to know before I purchase. Thanks! We don’t have any direct affiliation with any of these companies, but we may receive a small commission if you click a link to a product and purchase. Which is the best probiotic that would help with reoccurring yeast infections? 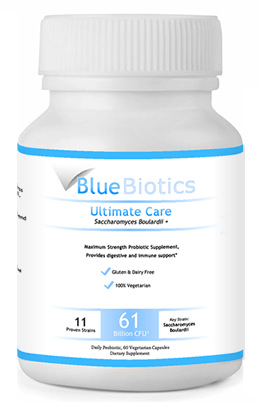 Our top pick is BlueBiotics Ultimate Care. My biggest problem is with constipation. I don’t like having to take laxatives that cause cramping and bloating. Which one is best? BlueBiotics Ultimate Care has helped me with constipation. 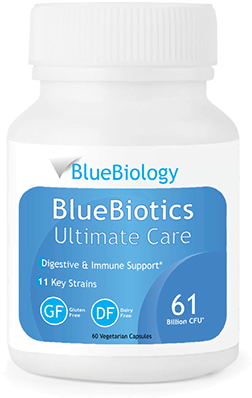 I have been using BlueBiotics Ultimate Care-61 billion CFU-11 strains for almost 90 days. I am very satisfied with it. Glad to hear it’s been effective for you. Are all of these good specifically for women’s needs or is there a better brand more geared to women’s needs? Hi Jen, yes, these supplements have benefits for both men and women. Probiotics are beneficial for the vast majority of people—there are no real gender-specific probiotic strains. I have a 13 year old daughter who always complains of stomach pains when using the washroom. She also has bad acne. What do you recommend for this age group? And can I take the same probiotic for weight loss? Can I also give it to my 5 and 11 year old? Yes, kids can benefit from taking probiotics but it’s best to check with your physician first. Hi, I want to gain weight which probiotic would be better? Thank you. Hi Liz, if you’re looking for a probiotic supplement for weight gain, I would look for any probiotic that contains lactobacillus reuteri, as it’s the only probiotic strain associated with weight gain. Are these products safe for kids to take? I heard that probiotics can help with many types of allergies. As far as I know, yes, but I would advise checking with your doctor first. When is the best time of the day to take probiotics? And does it help with diabetes? Would the Bluebiotics be a good choice for vaginal health? How important are prebiotics? Should they be included with probiotics? Prebiotics are very important, as they are essentially what probiotics consume for food. I would recommend getting them through a high-fiber diet. Can I refrigerate these, or what is the best storage? I purchased the three month supply. Hi Marian, yes, it is a good idea to refrigerate probiotics as they are living microorganisms and refrigerating them extends the life of the cultures. Will these highly rated products interfere with blood thinner tablets like the 2.5 mg Eliquis tablets I take twice daily? Not that I know of, Bev, but I would ask your doctor to be sure. Is it possible to have too many probiotics? I was prescribed prebiotics instead. Yes, but probiotics are mostly considered non-toxic. You would have to take an extremely high dose or be immunocompromised in order for them to be harmful. Hi Dawn, I would try BlueBiotics and if that doesn’t work try one of the other probiotics on our list. I hope your condition improves. Can probiotics have side effects or can it cause any harm to your health? Also can probiotics cause constipation? Can I have any of these probiotics if I am breastfeeding? But as with any supplementation, it’s best to consult with your doctor before adding a supplement to your diet. Can a teenager of say age 15 use any of these listed above? I believe so, yes, but you should consult your doctor first. I would try BlueBiotics, yes, but considering your situation you should run it by your doctor first before taking any new supplements regularly. Hi all, my father is diabetic without insulin dependence. Could he take these supplements? Hi Victor, yes there have been some studies that have reported positive findings on diabetics taking probiotics. It’s important to run it by his doctor first though. Hi Al, the time of day isn’t important but we do recommend taking probiotics with a meal because that way they essentially latch on to your food and travel with it to the intestines rather than being killed by stomach acid. Just find and eat real plain yogurts and forget about all these expensive supplements. Don’t probiotics need to be provided refrigerated, and be kept refrigerated, to be truly effective and not lose potency? It’s not totally necessary but it is a good idea to refrigerate probiotics because the life of the cultures can be extended. It’s also a good idea to buy from brands who freeze dry their probiotics. What is the best probiotic supplement I need to take for my vaginal yeast infection and bacterial vaginosis? We generally recommend starting out with BlueBiotics as it is a very versatile probiotic. If it doesn’t improve things then try the other supplements here on our list. Any suggestions who makes the best product for Kids? I have a 6 yr old son with many health issues, including severe food allergies – so I need a very clean product. Thanks for doing the research for us. Is there one you recommend that fights against H Pylori? I need a good product for gas. At night I can’t sleep for the gas bothering me. Which probiotic is best for this? Where does a person get the top biotic from & how much are they? You can find each of these products either on Amazon or directly on the manufacturer’s website. I need something to help with my digestive system and the bloating more than anything. Which product would you suggest? I would recommend starting with BlueBiotics Ultimate Care and if that doesn’t work for you try one of the other products on this list. Yogurt such as Activia can be beneficial, but unfortunately, they’re not transparent about the number of probiotics you’re getting. Hi Gerald, you may have a different experience if you try probiotics but they haven’t relieved my acid reflux. Gerald Longhibler, I recommend you look at adjusting your diet as well as probiotics to heal your gut. Look at Body Ecology and or LifeSpa.com and SuzyCohen.com. you can heal it. Gerald, was taking Omeprazole, and my chiropractor put me on Gastrazyme. You can get it at quality health food stores, or online also. It has taken care of my acid reflux. How can I give the probiotics to kids, when they refuse to swallow the capsules? I used to open it and add the powder to some juice, but know I’m concern that I’ve been damaging the probiotic. Hi Paula, maybe you could try a probiotic powder or gummy specifically formulated to survive the journey in that form. Just listened to a long infomercial on 1MD’s Complete Probiotics Platinum. It claims to be the best. Do you plan to review it? Thanks. I believe this is a relatively new product from them, we will definitely check it out. I have never heard of any of these. Are these health food store brands? You can find each of these probiotics either on Amazon or directly from the manufacturers on their websites. Should I consult with a Doctor before taking a probiotic? That would depend on why you want to take one. I would definitely recommend bringing probiotics up with your doctor, just to gain their input for your specific situation. Many of these products are available online via Amazon, though they may not all be available in the UK. Thanks for the feedback, we will look into this! Is there a probiotic and prebiotic combination pill you recommend? Hi Christine, there are some prebiotic+probiotic combinations on the market, but we haven’t reviewed them yet. Stay tuned though! Probiotics really help a lot. It will not only serve as a vitamin for the body but also as a way to make your body fit. Are any yogurts or kefir acceptable to meet standards as a probiotic? Yes, it’s great to get probiotics through your diet. Should probiotics come in dark glass bottles? Preferably, yes. Either in dark glass or non-translucent plastic as light and heat can kill probiotic microorganisms. Thanks Julia ! This has been a big help. Are there any chewable versions of these? I do not like to swallow pills. I currently have a chewable probiotic that I like very much but just wondering if these highly rated ones do as well? Hi Alyssa, I have the same issue but have found that I can stomach vegetable capsules but tablet pills can wreak havoc on my stomach. I don’t believe any of these products have chewable versions, but I do know there are several gummy probiotics on the market. I am taking a probiotic and very pleased with the results. I take only one a day instead of 2 a day. It was recommended by a pharmacist while I was traveling out of the country and it worked well and I continued taking it since 2016. Hi! I really enjoyed this article, I have been wondering if prebiotics are necessary for probiotics to be effective? Hi Lexi—prebiotics are essentially the food that probiotics feed on, so yes, ideally you should aim to get a healthy amount of prebiotics through your diet from fruits and vegetables. A prebiotic supplement can help as well. You have stated that probiotics have a definite shelf life. How long, for example, is the shelf life for BluBiotics Ultimate Care? Is it worth the price of purchasing a three-month supply if the product doesn’t last, even if stored precisely as recommended by the manufacturer? The last we checked, each of these products has a shelf life of a year, but regardless of the brand, it’s always good to refrigerate probiotics because it will extend the life of the living microorganisms. How important is refrigeration? I notice at Whole Foods, all the probiotics are refrigerated, but if I’m ordering online, who knows how long it’s been sitting in a warehouse. Thanks. It depends on the particular product, but refrigeration can extend the life of the cultures. Choosing a brand that freeze-dries their product helps. Julia. Is it necessary to take an acid reducer such as Zantac, when taking probiotics for maintenance? No, there’s no indication that’s necessary – just choose a probiotic has enteric coating and you should be good to go. Zantac changes your microbiome and reduces the gut flora due to changes in pH. So by taking the Zantac, you *could* be making matters worse. Taking a reputable probiotic *might* help you overcome the GI issues you’re having which is leading you to take the Zantac or similar medication. Do u have a recommendation for a probiotic for someone who is high oxalates and histamine? Thank you, I am not sure what probiotics to avoid and neither are my doctors. They only know what medications to prescribe. Thank you so much for your help. Your reviews are great. Hi Janet, I would try one of the products listed here and reevaluate from there. I’m mainly interested in cutting down weight.we eat very healthy at home 80% fruits and veggies and I’d like to add a probiotic to get rid of extra fat. Which of these is best for that? Thank you! We are healthy & have no medical issues. Hi Megan, I would try out our top pick but each of these probiotics has their merits. Julia, I saw this article and decided to try the Blue Biotics for my IBS symptoms. I’m 62 still working, and the bathroom issue could really prove trying. I’m happy to report this product has helped tremendously! I now have both my daughter’s taking it also. Very useful info here Julia. Appreciate your work!! For those who has perturbed gut microbiata (due to antibiotics in general but also chemo drugs etc) what is the best probiotic in market? if there is not an ideal probiotic manufactured yet what microbes or which cocktail of microbes would be considered as best/ideal/must ? Out of the products we’ve analyzed, the probiotics listed here were the best we found on the market. They’re all quality products, each with their pros and cons. We chose BlueBiotics Ultimate Care as the top probiotic on the market because of its variety of strains and thus versatility in addressing various health issues. Concerned about viability of the probiotics after being shipped. Packages & Products arrived extremely warm do to the 90 degree temperatures. My understanding is the bacteria dies in over 77 degrees. Hi Merry, it’s definitely a concern. For this reason, I recommend a) choosing a probiotic with a relatively high CFU count because some will invariably die on the journey; there’s just no way around it. And b) choose a brand that freeze-dries their probiotics. My doctor told me to get antibiotic enteric coated 10 billion CFU 10 strain and we cannot find that combination anywhere, thanks. All of these products listed here are designed to resist stomach acid, have multiple strains, and have more than 10 billion CFU of probiotics so you can’t really go wrong with any of these options. We did choose BlueBiology BlueBiotics as our number one choice for a reason though, so I would start there. Can you tell me what the best probiotic for a child in primary school would be? My 7 year old cannot yet swallow capsules and J am uh nsure that anything powder thg would make it to his gut through stomach acids. Hi Angelique, you could try probiotic foods (kimchi, sauerkraut, etc. ), or probiotic gummies (but it’s unclear as to whether the probiotics reach the intestines via this mode of delivery) and reevaluate from there. It’s probably best to consult your physician about the matter as well. Best of luck. have you ever compared Xyngular products ? I use some and really like them but wonder how they rate against products out there. I would like to buy for my stomach problem. Where can I buy & What is the cost?.. For those symptoms I would go with the number one rated product based on our analysis, BlueBiotics Ultimate Care. It has multiple strains that are proven to address those issues. What is your thought on the product NUCIFIC Bio X-4? Is NUCIFIC a trusted company? Do know anyone or have any feedback from people who have dealt with this company and have tried Bio X-4? Hello Julia, I would like to know if you know of any product that contains all the ingredients that bio-x4 claims such as EGCG,Caralluma Fimbrata root, Lipse, mylase, bromelain (digestive enzymes). Thanks! I was about to buy Vital Reds until I saw this! Can you comment on Align as a probiotic? Hi Colleen, there’s nothing wrong with Align’s probiotic itself per se, but it only has one strain of bifidobacterium and is quite expensive. There are cheaper probiotics on the market that have more probiotic strains, which means a wider range of health benefits. Thank you so much for this actually rational review, I feel like all the other sites were just paid to mention the store brands. I went for the top 1 of course, arriving tomorrow and can’t wait to start it. Also thank you for educating on what actually matters, again, not the paid reviews. That’s great to hear, George. I hope it works out for you. What is better 51 billion cfu or 100 billion cfu? Hi Michele, both of those are potent doses that should be effective. I would try them out and see what works best for me. I can’t find those products in Canada! Nor can I find what ones are good here! I have Fibromyalgia and trying to find one that helps. Hi Angel, I would check both the manufacturer’s website and ecommerce stores such as Amazon. If one doesn’t ship to where you live, there’s a chance the other option does. Hope that helps. Will Blue Biotics get rid of my gas? I am taking Renew probiotic now and it doesn’t help with getting rid of my gas. Hi Sandy, it really depends on a lot of factors. I would try it out and see. I have been using Probiotic 10 for a few years now, should I continue or change to one of the top 5 listed? Hi Linda, it depends on how well your current probiotic is working for you, but I’m always open to trying new products to see if I can find something more effective. Very interesting information on probiotics. Thank you. Hi CJ, sorry to hear about your situation. I would consult with your doctor to see if it’s ok to add probiotics to his diet. Hi, will these probiotics make you diarrhea or any uncomfortable? I try some over the counter probiotic, and it makes me feel need to go, but can not. It feels very uncomfortable. Hi Monica, probiotics have been known to cause bloating/gas in some individuals, but it usually subsides after your body adjusts. The only real way is to try it out and see for yourself because they affect everyone’s body differently. The list you provided was exactly what information I needed. Unbeknownst to me the probiotic I was using needed to be refrigerated and I had ordered online. So going to go with freeze-dried and the number one on your list. This is why I read Consumer’s Health Report. Muchly appreciated and keep up the good work. I hope it works well for you. Take care. Can I get BlueBiotics in Canada? I believe so, but I would check their site or Amazon Canada to make sure. Which probiotic of the five would work best for constipation? All the products here are capable of helping with constipation. The product with the best variety of strains is BlueBiotics Ultimate Care. Hi Lori, sorry to hear about your experience with that brand. 10 billion CFU is a pretty low dosage so yes, I would recommend trying a different probiotic. I am considering purchasing BlueBiotics but am concerned with any possible negative interactions with spirulina and flax seed, if I were to take all three at the same time every day. Would you be aware of any such interactions? I am 60 years old and in relatively good health. Hi Partick, I’m not aware of any negative interactions with those supplements but I would bring it up with your doctor if you’re concerned. Do you have a recommendation for the best probiotic to help with depression or perhaps overall mental wellness? Are there certain strains I should look for? Hi Brian, the studies that have shown relief from depression included lactobacillus and bifidobacterium strains, so I would start there. Have you done a review on Bio-X4? If so, how does it stack up against your top 5? I am thinking about ordering BlueBiotics. Buying a 6 month supply saves quite a bit of money. I am concerned about their shelf life. Will that be a problem with effectiveness? It shouldn’t be a problem—I would recommend refrigeration though. Is any particular brand better for taking after being on antibiotics for a month? Is it helpful to take extra doses after antibiotic use? We just recommend taking a probiotic with a wide variety of strains. We think BlueBiotics Ultimate Care fits that bill the best, but these other probiotics are good as well. I wouldn’t recommend taking more than what the label on the product suggests. Where can the Blue Biotics be purchased in Atlantic Canada? Hi Jill, I don’t believe they ship to Canada unfortunately, but I would try contacting the brand directly through their website. I have two kids i want to start on probiotics ages 12 and 3. What brand would you recommend for them? Hi Joann, this would be a good topic to bring up with your doctor/pediatrician. Thanks! Capsules or liquid form? Which is more effective in your opinion. I’m not aware of any scientific testing on this topic in regards to probiotics specifically, but there is evidence that enteric coating is effective in improving the bioavailability of supplements in general. In other words, capsules are likely more effective. No one has addressed which probiotic is best for weight loss. Love your reviews & I am taking now BlueBiotics; just want you to please read this as I need something very badly for dry eyes and came across this new article. Do you know any probiotic that helps dry eyes? The article discusses “Enterococcus Faecalis” in a test study. I read this article and can’t understand if this probiotic can be harmful. I have Sjogrens and severe dry eyes. I do take the BlueBiotics at this time and need to know what to add for my eyes. I take Omega 3’s and some regular vitamins that are not helping. Your assistance would be appreciated. Hi Janet, for dry eyes, you can try over-the-counter eye drops. If that’s not effective, I would bring it up with your doctor because if you have chronic dry eyes, you may need a prescription medication. Good luck. I have gastrointestinal emptying problems and GERD. I have been on Prilosec for a long time. I had 1 kidney removed and I want to stop Prilosec. I ordered Synbiotic 365, I also take Ativan and Effexor for depression and anxiety. What probiotic do you suggest for me? 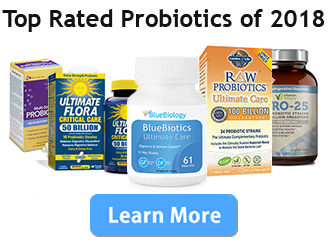 Hi Patsy, I usually recommend trying BlueBiotics Ultimate Care by BlueBiology, as it received the highest ratings of any probiotics we’ve tested. However, I highly recommend asking your doctor considering your unique health situation.